Neil Gaiman’s collection “Trigger Warning” came out on February 3, 2015. Like “Fragile Things” 5 years prior, “Trigger Warning” is a medley of short pieces. Some of them are just a few pages long, others are longer. Some are poems. Some are fairy tales. One is a witness’ testimony during a police interview. The collection title “Trigger Warning” refers to the dark places , “the monsters in our cupboards and our minds”, as Mr. Gaiman puts in in the introduction, maybe deeply hidden, maybe lurking just below the surface. This is much like the title “Fragile Things” may remind that “People break so easily, and so do dreams and hearts”, per that collection’s introduction. Both offer a suggestion of a unifying feeling, but are broad enough so as not to be overbearing or restrictive: fragile things, trigger warnings… can be anything. The miscellany of styles is a delight, making each next piece even more of an adventure than it would have been just for the story line. “The Truth Is a Cave in the Black Mountains”, a haunting tale a few lines down the table of contents, was where I settled into the book. Three other pieces moved me memorably. In the order of appearance, I laughed tears reading ‘May Tale’ in ‘A Calendar of Tales’. (Curled up on dot’s couch, on the evening of the day when lots of weird stuff happened, once it’s finally calmed down, calm before the storm, the eve of when it got real…) It begins so: “In May I received an anonymous Mother’s Day card. This puzzles me. I would have noticed if I had ever had children, surely?” And I kept giggling for the rest of the silliness, as if tickled. ‘The Case of Death and Honey’ is a story about Sherlock Holmes and what he was really up to when he retired to beekeeping, which is not a detective story. ‘The Sleeper and the Spindle’ is where two familiar fairy tales meet, and make a detective story of sorts. ‘The Case of Death and Honey’ was delicious for several reasons. It has two parallel narratives that take turns on stage, distinguished by marginal widths. One side is narrated by a third person, styled, presumably, as an old Chinese story. Another one is by Sherlock Holmes. Sir Arthur Conan Doyle’s stories are rarely told by Sherlock. We encounter Mycroft Holmes on his death bed. What we knew apropos about his extraordinary mind comes into the spotlight for a couple of pages and evokes thoughts about what it would take to have a functional state. Next, I recently read ‘1493: Uncovering the New World Columbus Created‘ by Charles C. Mann, re-read some of the Arthur Conan Doyle’s stories, and watched BBC’s Sherlock. ‘The Case of Death and Honey’ lands well on that background, as if I discovered something new in my neighborhood. The delight of ‘the Sleeper and the Spindle’ is in how everything is indeed not what it seems. 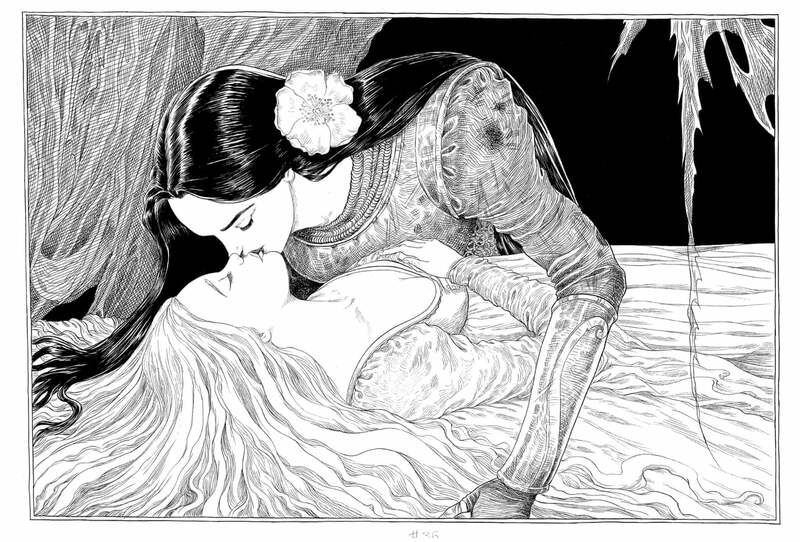 The grown up Snow White meets the Sleeping Beauty, and we thought we knew those girls, and we changed what we thought we knew, and again, and again. Besides, I love how the Queen is portrayed. By the way, this is not the same Snow White as in ‘Snow, Glass, Apples’ (e.g. within 2009 “Smoke and Mirrors“); that girl was a little bit… you know… This one is beautiful, smart, powerful, playful, and absolutely secure and respected in all that. The woman I strive to be; how I want to be seen.